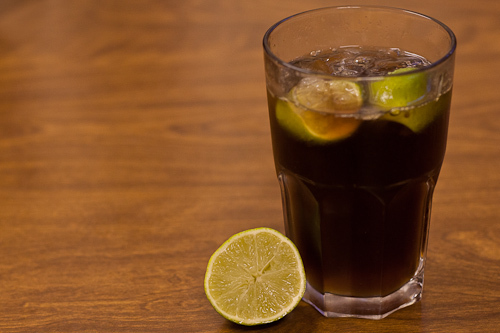 A standard Cuba Libre blends the flavours of Cuba (a white rum) and “The Free World” (Coca Cola), with a bunch of lime juice. 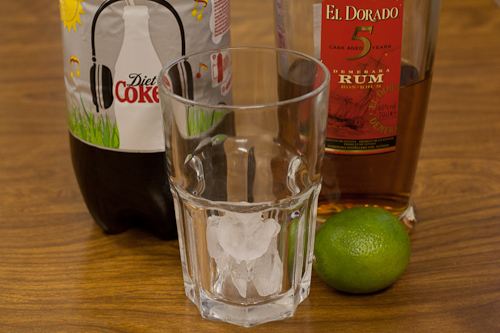 In contrast, and as the name would suggest, the Oscuro is a Cuba Libre made with Darker Rum. Right now I’m enjoying a golden 5 year El Dorado (a drink blended from rums with a minimum age of five years aged in oak barrels) , but I also enjoy it made with a nice shot of Captain Morgan’s. It’s a simple flavoursome drink, and very simple to make. Om nom nom. Roll your lime under your hand on a board to squish its insides a bit, thus encouraging the juices to flow once you cut into it. Cut the lime in half across its body, and then cut one of those halves in half again. Squeeze the two quarters hard, and drop them into the glass. If you have no fresh limes (it happens!) I’ve been pleasantly surprised by Tesco’s bottled lime juice. Replace the half a lime with two and a half teaspoons of bottled juice. I measure two teaspoons, not worrying about any extra that spills over. Add the ice to the lime juice. Finally, you guessed it, top up with diet coke. The pouring action of each stage should mix the drink for you, leaving you with a tasty limey, rummy, cokey drink. Tasty.